Each year, the William and Mary Law School's Property Rights Project awards the Brigham-Kanner Property Rights Prize to a deserving person "whose work affirms that property rights are fundamental to protecting and preserving individual liberty." This list of past recipients is an All-Star roster of property scholars and jurists, including lawprofs Frank Michelman, Richard Epstein, James Ely, Carol Rose, Thomas Merrill, and Supreme Court Justice Sandra Day O'Connor. The Project just announced that Michael Berger has been selected as the 2014 recipient of the Prize. As noted, Mike "is the first practicing lawyer to receive the prize and is widely considered to be among the best takings lawyers in the nation." The Prize will be presented at the 11th Annual Brigham-Kanner Property Rights Conference, on October 30-31, 2014 at the Law School in Williamsburg, Virginia. Michael M. Berger, a partner in the Los Angeles office of Manatt, Phelps & Phillips, will receive the 2014 Brigham-Kanner Property Rights Prize at the 11th annual conference on October 30-31 sponsored by the William & Mary Property Rights Project, the Law School announced today. The project presents the Brigham-Kanner Property Rights Prize each year to an individual whose work affirms that property rights are fundamental to protecting and preserving individual liberty. Berger is the first practicing lawyer to receive the prize and is widely considered to be among the best takings lawyers in the nation. Joseph T. Waldo, a 1978 graduate of the Law School and an attorney at Waldo & Lyle in Norfolk, Va., is co-chair of the conference coordinating committee. Waldo said Berger has had a tremendous impact on the field of property rights law during his distinguished career. 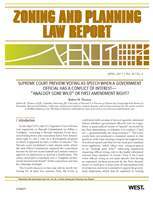 "Practitioners shape the law by selecting and litigating cases that will advance causes and positions important to society," Waldo said. "Mike Berger's career demonstrates a successful practice in which he has shaped the law at the highest levels of both state and federal court. His practice, scholarship, publications, and teaching make his recognition as the 2014 Brigham-Kanner Prize recipient well deserved." Mark F. (Thor) Hearne II, a partner in the Washington, D.C., office of Arent Fox, commented that "Michael Berger is one of the great modern champions of this foundational constitutional principle. And all those who cherish the Fifth Amendment owe Michael a great debt for his years of principled advocacy defending this essential concept." Hearne noted that Berger's energetic defense of property owners contributed major decisions to Fifth Amendment jurisprudence in cases such as Tahoe-Sierra (where Berger's opposing counsel was John Roberts, who later became Chief Justice of the U.S. Supreme Court), Del Monte Dunes, Presault, and First English. Robert H. Thomas, who practices law in Hawaii at Damon Key Leong Kupchak Hastert, said Berger "represents the best of the academic and practice worlds: the author of countless scholarly articles, and a compelling advocate in landmark cases. By so doing, he has advanced the law and in the process served as a model and mentor." Thomas noted that at the end of a seminar he attended, an audience member asked: "What should my client do after we've lost a regulatory takings trial?" One panelist - a government lawyer - responded, "You mean after you call Mike Berger?" After attending Brandeis University, Berger received his J.D. from Washington University School of Law and his LL.M. (in real property) from the University of Southern California. The Brigham-Kanner Property Rights Prize has been awarded annually since 2004. 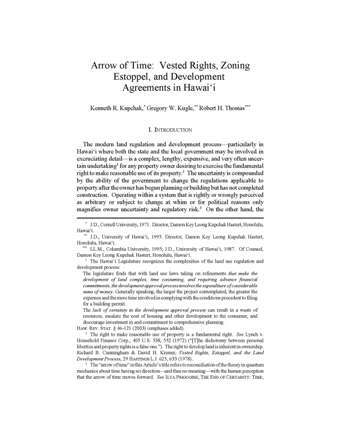 It is named in recognition of the lifetime contributions to property rights of Toby Prince Brigham, founding partner of Brigham Moore, LLP, in Florida, and Gideon Kanner, professor of law emeritus at Loyola Law School in Los Angeles. Previous recipients include Professor Frank I. Michelman of Harvard Law School (2004), Professor Richard A. Epstein of New York University Law School (2005), Professor James W. Ely, Jr., of Vanderbilt University (2006), Professor Margaret Jane Radin of the University of Michigan Law School (2007), Professor Robert C. Ellickson of Yale University (2008), Professor Richard E. Pipes of Harvard University (2009), Professor Carol Rose of the University of Arizona (2010), Supreme Court Justice Sandra Day O'Connor (2011), Professor James E. Krier of the University of Michigan Law School (2012), and Professor Thomas W. Merrill of Columbia Law School (2013). For details about the conference schedule and participants, please contact the William & Mary Property Rights Project at lsdevl@wm.edu or call (757)221-3796.